Everton in the Community has joined forces with the Blues Principal Partner, SportPesa, in a partnership that will see them become an Official Partner of the Club’s charitable arm. The partnership will see SportPesa provide funding for Everton in the Community’s long-standing flagship mental health programme ‘Imagine Your Goals’, which since April 2018 has been funded internally using finite charity resources since it was affected by external NHS budget cuts. 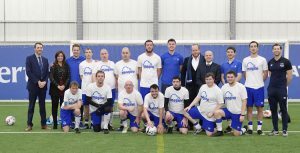 Through its five football therapy sessions each week, Imagine Your Goals has been at the forefront of tackling these issues on Merseyside for over 10 years and supports over 200 individuals each week, offering people who are living with mental health issues an opportunity to talk about their problems and seek help and support in a familiar environment. Speaking on the new partnership, Everton in the Community CEO Richard Kenyon said: “As a charity we have been delivering mental health provision for over a decade with ‘Imagine Your Goals’ being one of our flagship programmes. It has been extremely valuable to so many people in our local community but almost a year ago our external funding was cut, which has meant we have been funding it internally through Everton in the Community. And to see the programmes impact first hand, Everton stars Phil Jagielka, Leighton Baines, Michael Keane and representatives from SportPesa met participants from Imagine Your Goals at USM Finch Farm to find out more about how Everton in the Community has helped change – and even saved – their lives. 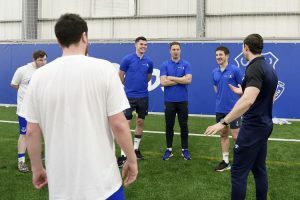 The Blues trio spent time managing, and refereeing, a short-sided game between the young men and offering advice on technique and communication before there was the opportunity for the group to have a relaxed discussion about how best to deal with high-pressure situations in their lives before the participants opened up about their battles with mental health and how the Club’s official charity has supported them. The partnership will also see SportPesa become a ‘Founding Partner’ of Everton in the Community’s mental-health focused campaign, ‘The People’s Place’, which will see the charity build and develop a purpose-built mental health facility close to Goodison Park to support anyone in need. And, in addition to a financial contribution to The People’s Place, SportPesa have created ‘Goals That Give’, a new initiative that will see them donate £1,000 for every Everton goal scored at Goodison Park for the entire length of the partnership. This money will be backdated to the start of the 2018-19 season and will include the goals scored against Gor Mahia in the SportPesa Trophy at Goodison in November bringing the current goal tally to 31. Corporate social responsibility is at the heart of SportPesa’s values with the organisation already involved in a number of grassroots projects across Africa as the Blues saw first-hand when they visited Tanzania in July 2017. SportPesa’s European Headquarters have been based in Liverpool since 2017 and they are keen to build on the work they already do in sport development and local communities globally and have been widely impressed by Everton in the Community and the positive impact the charity has on people across Merseyside and beyond. The partnership with Everton in the Community will also see SportPesa commit to conducting staff engagement courses across all current and future markets of operations to help educate their staff on mental health wellbeing. The partnership with Everton in the Community will also see SportPesa commit to conducting staff engagement courses across Kenya, Tanzania and the UK to help educate their staff on mental health wellbeing.